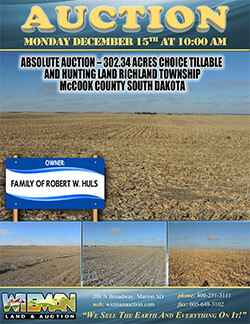 The auction to be held at the Wieman Auction Facility (inside and heated), located 1 South, ½ West of Marion SD. 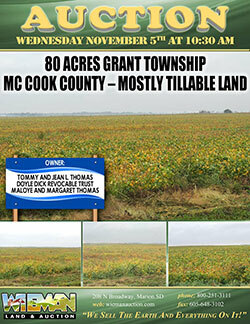 SE � of 14-103-54 except the West 715� of the East 1465� of the South 890�; and that part of the NE � lying South of the former Railroad, Richland Twp, McCook County (located on north side of Hwy 38 � the improved acreage is out � not included)! NE � of 23-103-54 including R.W. 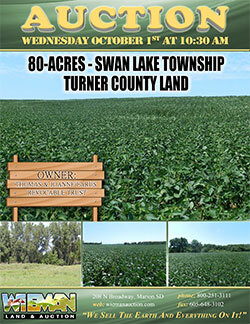 Huls Conservation Easement Tract, except Lot H1, except Lot C1 in NE � NE � and except Lot C1 in SE � NE �, McCook County This tract is located across the road, just south from Tract # 1 and will be offered as 154.55 Acre unit. 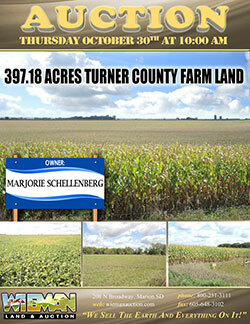 The following land will be offered indoors at the Spencer Community Coffee Shop 215 2nd St. Spencer, SD. LEGAL: The SW � of Section 18, 104-56 McCook County, South Dakota. LEGAL: NW � of Section 18, 104-56 McCook County, South Dakota. 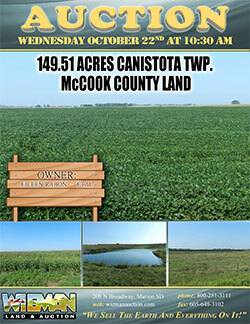 To be held on the land site located from Wall Lake Corner (Jct of Hwy 42-Hwy 151)) go 2 south and 1 west; or from Wall Lake Oil Jct and 41 St. go 1 west on 267th St.; or at the Junction of 462 Ave. and 267th; or 9 ½ miles west on 41st Street from I29 – 41st St. exit Sioux Falls SD. LEGAL: The NE 1/4 of Section 20, 99-48 Lincoln County, SD. 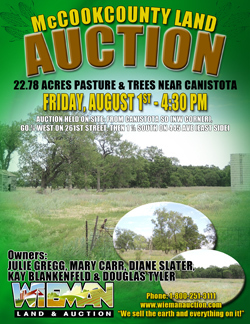 To be held indoors at the Wieman Auction Facility, 1 South and ½ West of Marion SD. 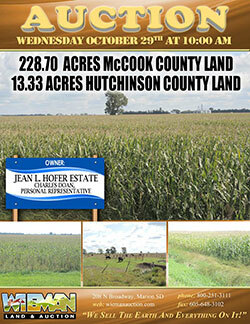 We will offer the following land at public auction in the Corsica Community Center 355 East Main St. Corsica, SD. LEGAL: The South 975� of the North 1807.98� of the West 1173� and the North 832.98� of the NE � of Section 14, 99-64 Douglas County, SD. We will offer the following land for sale indoors at Nicky’s West Hwy. 34 Madison, SD. LEGAL: The W � of the SE � of Section 35, 105-53 Lake County, SD. SW � except Ordal�s Add. In Section 35, 105-53 Lake County, SD. LEGAL: NW � of Section 35, 105-53 Lake County, SD. The NE � except Lot H-1 in Section 6, 102-54 McCook County, South Dakota. 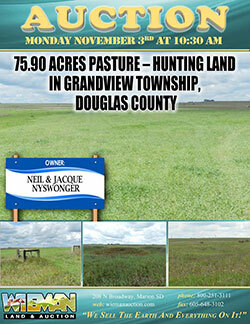 Our family will offer the following land at public auction located in the Ola Community Hall in Ola, SD located from I-90 & Pukwana Exit , 10 ½ miles south on Hwy. 50, 2-miles west, or from Academy, SD approx. 20 miles northwest on Hwy. 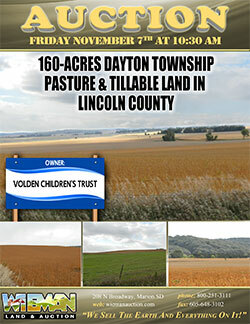 50, 2-miles west (signs will be posted). 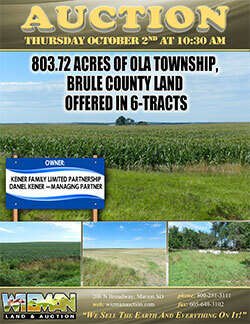 LEGAL: NW � except Lot H-1 Section 32, 102-70 Brule County, SD. 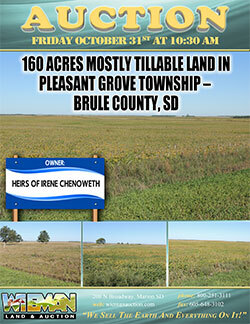 LEGAL: The NW � of Section 33, 102-70 Brule County, SD. 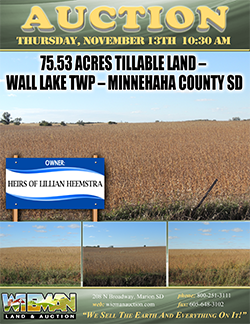 I will offer the following land for sale at public auction in the Wieman Auction Facility located from Marion, SD 1-mile south ½ mile west on Hwy 44. 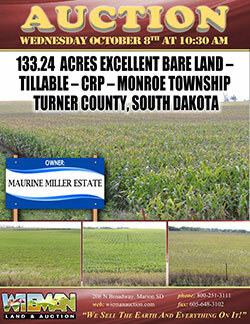 We will offer the following land at auction at the Armour Fire Hall located 2 Blocks North of the Courthouse in Armour SD. The NE � of Section 26-98-63 except the North 795� of the East 2660� in Douglas County South Dakota. 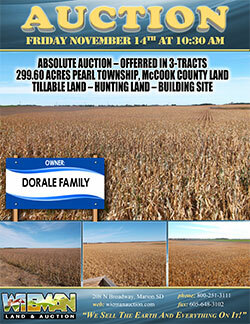 This auction to be held at the Parker Community Building, Main Street – Parker SD.